Andy went along to Music Hack Day, London. Here‘s the result of that weekend’s hacking. Generative audio from found 16mm film. Projecting the found footage of “The Airman” using a scratch built film projector (created using a few parts from a defunct projector, 3d printed parts and threaded rod). The film is projected onto a small screen and captured by a USB webcam feeding into Quartz Composer to process the footage and then capture pixel values, which are then passed by midi to Pure Data. The PD sketch was created by Martin Brinkmann, and adapted to accept the passed midi controller values to adjust the sounds being created. In future, I hope to get the film sync'd with a strobing light source, to produce a still image; and to construct a PD (or similar) sketch from scratch to generate the music. Quick post to point at Andy's Thingiverse profile; bits and bobs we've designed for 3d printing. Hacklet #18 - Brewswitch in action! 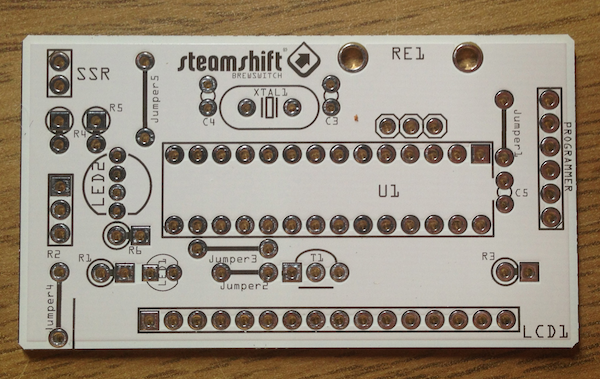 The brewswitch boards weren't totally right; no major issues but not where I want them to be. First up, I didn't take advantage of the fact that Fritzing manufactured boards can have tracks on either side; meaning that I ended up with a number of jumpers. Not a major issue, but more stuff to solder up. 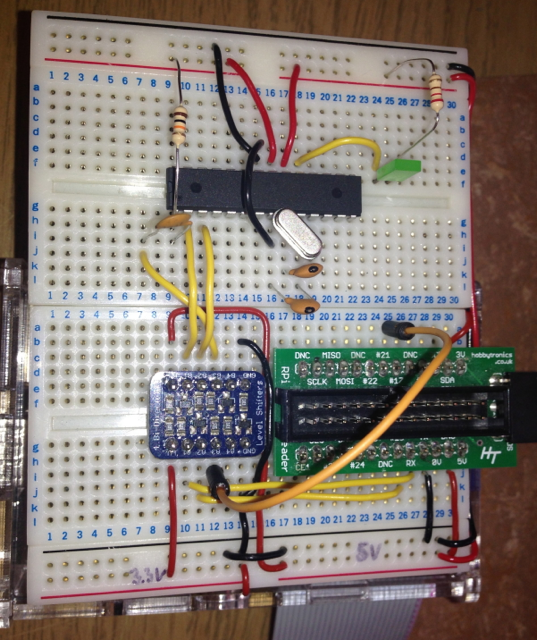 The 2nd issue is that I'd just used an RGB Led from Fritzing and not checked whether it was common anode or cathode. 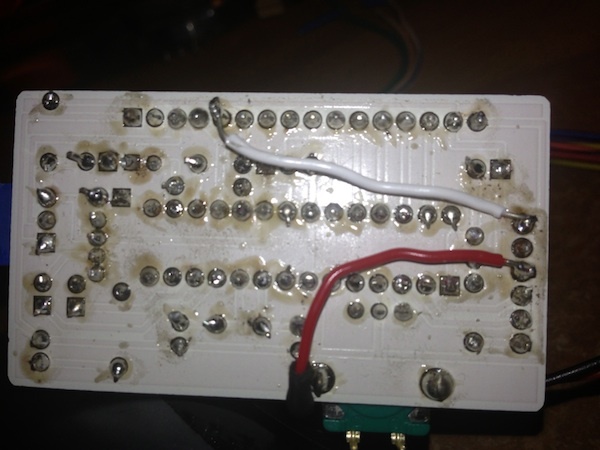 Turns out my board needs a common anode, and the LEDs I bought were common cathode. So in the interests of getting a board working, I found a common anode LED and soldered it up with long wire legs so it would fit. 3rd up, OOPS! I managed in the design to connect GND and +V on the Atmega chip. 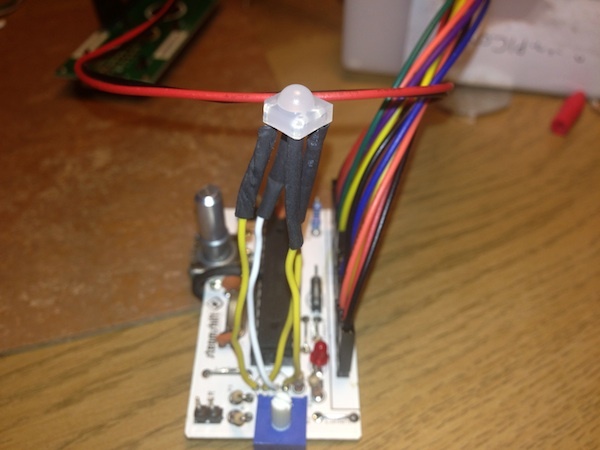 A little creative soldering and that was resolved too! The 4th issue was that I missed that the LCD required a link to ground from pin 5. Again, no problem with a bit of wiring. And finally, I found that I'd forgotten to put a resistor connecting the data pin of the temperature to +5v. I wired that in line, and off we went. All of these issues will be rectified in the next version of the boards, but considering its my first crack at getting something made, I'm pretty pleased with the results. Especially as it does actually work! Next job, solder one up and see how it works! Big up to SoMakeIt - the Southampton maker space; if you're in this part of the world and into making, you need to get yourself along! As much as I would have loved to go to WWDC this year, I decided that if I had a couple of grand spare (haha!) or perhaps rather less, that I would rather spend it on being part of the maker revolution - hence the eShapeOko post from the other day; and now 3d printing. As a first foray into this field, I'm lucky enough as a member of SoMakeIt to have access to the 3D printer that member Chris has lent to the space (in part in thanks for all the expertise from Bracken and others that has helped get it running). I figured that a good place to start (apart from the inevitable Minecraft stuff that my son would undoubtedly like me to print) would be a few bits for the eShapeOko. Thanks to Thingiverse I was able to find this cable chain which looks ideal for keeping the router's cables out of the way whilst its moving, a series of pen holders and an Arduino (Uno) Altoids Insert. In terms of software, we need Slic3r and Printrun; I'm running these jobs using a mac so needed the Mac binary of Printrun available here. And thanks to standing on the shoulders of those who've been there before I was able to get Slic3r configured using a config file pre-prepared for the SoMakeIt 3d-printer. Starting with the simplest model - the Arduino altoids insert - I downloaded the .stl file, imported it into the configured slic3r app and exported the GCode. 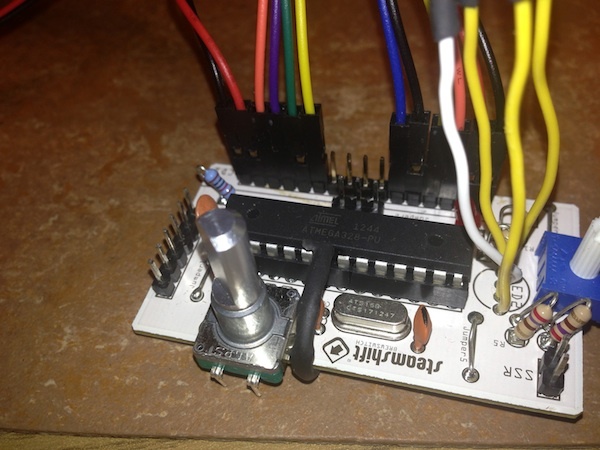 This hacklet consists of a couple of images from my time playing with Fritzing to design the next iteration of the Brew Temperature Switch.